Are you thinking about getting a Libra tattoo and want something unique and personal? The seventh sign of the Zodiac, the sign of [Libra], lasts from September 23rd to October 22nd and has many symbols to represent it. Libra tattoos are rich in astrological and personal meaning. Keep reading to find out more about different Libra tattoos and how to make them your own. Libras in astrology are known for two things: being social and being just. Libras will weigh out both sides of any predicament and find the most rational decision to be made. They also make friends quicker than most and are known for impeccable style. It's hard to dislike a true Libra and even harder to not respect one for their balanced equilibrium. Each of these signs is symbolic of a different part of Libra. Often called the glyph, the symbol for the Libra sign is perhaps the most well known Libra tattoo. The symbol itself is said to be a representation of the sun setting, a way of symbolizing a new day. The symbol is also said to show Libra's "middle of the road" nature. The rising bump in the middle shows that a Libra can balance both sides of an issue without harming either side. Another interpretation of the symbol is a symbol that looks similar to an equal sign. The rising bump in the first line illustrates the justice that the astrological sign possesses. The scales are another common type of Libra tattoo. 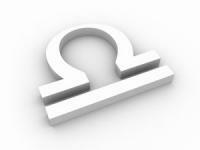 The symbol itself is symbolic of Libra's balanced nature. Many Libra tattoos feature the two arms of the scale as equal, rarely at uneven amounts. This is because the average Libra is about balance. They strive in daily life to balance both ends of the scale together. The tattoo functions in the same way and for many Libras, reminds them of the harmony they should seek daily in every day life. As the main symbol of the Libra sign, it is also curious to note that it is the only astrological sign not symbolized by an animal. The constellation itself is not as balanced as other symbols of the sign but the constellation appears during the duration of the Libra sign. Alpha Librae and Beta Librae are the two sides of the scale and the arms strutting out from them are the pans for the scale. Suggested by H.A. Ray, there is a theory that believes beta Librae is the top tier, gamma and alpha Librae the second and three additional Librae stars are the third tier. This creates a more balanced layer system. If you're interested in a Libra tattoo, here are some ideas on what to get and [::Category:Tattoo_Placement|where to get it]] to help you get started. 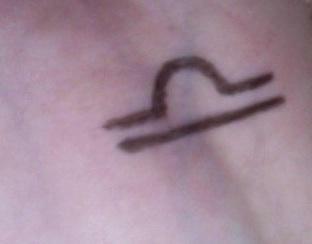 The Libra glyph is a great tattoo idea for someone who doesn't want a large tattoo. It would look great as a wrist piece (on the inside of the wrist), on the lower back or in between the shoulder blades. There's also a lot of customization options such as the color of the lines, backgrounds, and incorporating the glyph with other artwork. The Libra scales can create a stunning visual piece. Placement suggestions include on the foreceps, back or ankle. The scales can easily be combined with other figures such as a lady of justice, or celestial bodies to create a larger themed piece. 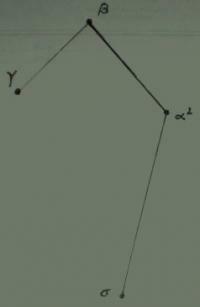 For the Libra constellation, there are many great ideas. For the brazen, consider a large back piece of a large night sky with the Librae stars as the focal point. You can even include nearby constellations in your piece.